Today only, save 30% off 100% cotton luxe sateen Hotel Duvet Cover Sets! Get a Full/Queen set for only $37.79 or a King set for only $44.09. Choose from an assortment of colors. PURE 100% COTTON LIGHTWEIGHT DUVET COVER SET – Do you love the luxury and quality of W Hotel duvets? Now you can bring your premium travel experience home with our 400-thread-count, pure cotton duvet cover sets. We rely on yarns made with 100% long staple cotton fiber and a smooth sateen finish. Our eco-friendly duvet covers retain softness for a lifetime and resist fading. From boys’ duvets in classic hues to king duvets in show stopping patterns, we offer every size and style. Each set includes a Duvet Cover in pure 100% cotton and 2 matching Pillow Shams. Each duvet cover features internal ties to make slippage and wrestling with your comforter a thing of the past. 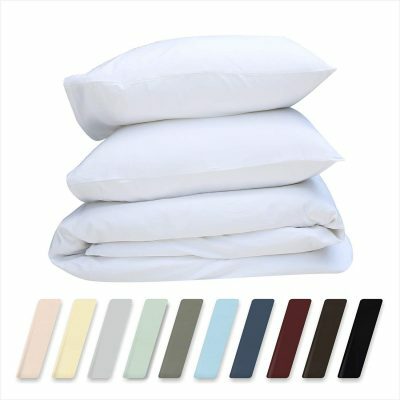 If you prefer wrinkle resistant bedding, no worries. Just use a short dry cycle and pull your linens from the dryer right when it ends. Our duvet covers are machine washable, quick dry, and crafted to stay vibrant, so care is worry-free. LEED v4 GOLD CERTIFIED – Our linens are made ethically, using environmentally friendly materials and processes. Each product is created in a certified, socially compliant, and awarded factory that supports more than 300 working families. Our fabrics are made in a Gold Rated LEED v4 Certified Facility, which is equipped with leading-edge machinery. It is only the second manufacturing facility in the world to achieve Gold LEED EBOM certification from the USGBC.